TK Assisted Living Co-operative (TKALC) supports two boys with autism who live in a house at Ryde in Sydney. 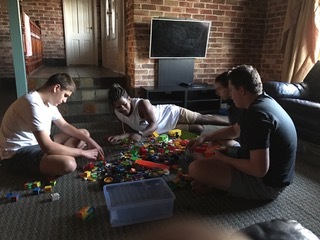 TK Assisted Living Co-operative (TKALC) is a charity established in December 2016 by two families with the aim to set up a family run group home in Ryde for two young men, Joel and William, who are both aged 19 and have severe autism. The primary aim of TKALC is to act in the best possible interests of the housemates, and to maintain an active involvement in their lives and the way that the home away from the family home is run. The members and board of this co-operative are the four parents of the families involved. The families, on behalf of their adult children, effectively tailor policies and practices, appoint/manage staff who are required on a 24/7 basis and perform hands on roles in the home. By the families having regular involvement and contact with Joel, William and staff, the person-centred and safety needs of the boys are met. It also means the time that the families have with Joel and William is much less stressful than if they were living at home full-time. Property leased by TK Assisted Living Co-operative. Income comes from the housemates’ individual NDIS packages and disability support pensions. Try our FAQ and Membership pages, or you can get in touch with us through our contact form. Thank you! Your signup request has been received! You will receive an email to confirm your subscription. Hmmm... Try submitting the form again and make sure you have filled out all the fields. Our purpose is to create great homes and life experiences for people with disabilities. Our focus at the moment is Sydney (NSW). If you live outside this area, fill out the General Inquiry form opposite and we'll get in touch with you. Please get in touch for all enquiries.